For over fifty years the Higher Education Research Institute (HERI) at UCLA and their Cooperative Institutional Research Program (CIRP) have been administering surveys to incoming first-year college students at U.S. institutions of higher education. The questions they ask have evolved over time, but contain lots of interesting tidbits — ranging from the percentage of students who think it is important to “develop a meaningful philosophy of life” (down from 86% in 1967 to 46% in 2015) to the percentage who think “colleges should have the right to ban extreme speakers from campus” (up from 20% in 1974 to 43% in 2015). UP has been a regular participant in these surveys, which in recent years have started to add questions related to student mental health and psychological well-being — some of which may be interesting for faculty and academic staff to consider when noticing trends for our students. According to our Office of Institutional Research, about 85% of UP’s incoming first year students in 2016 filled out the HERI survey — which is a remarkably high response rate. UP is then provided with data on its own students and pre-established comparison groups. One of these comparison groups is “Catholic 4-Year Colleges (High Selectivity)”*, and data is also available up to 2015 on national trends in a 50th anniversary report. So how do our students compare? In general, it looks as though entering UP students seem to report slightly higher rates of mental health concerns. 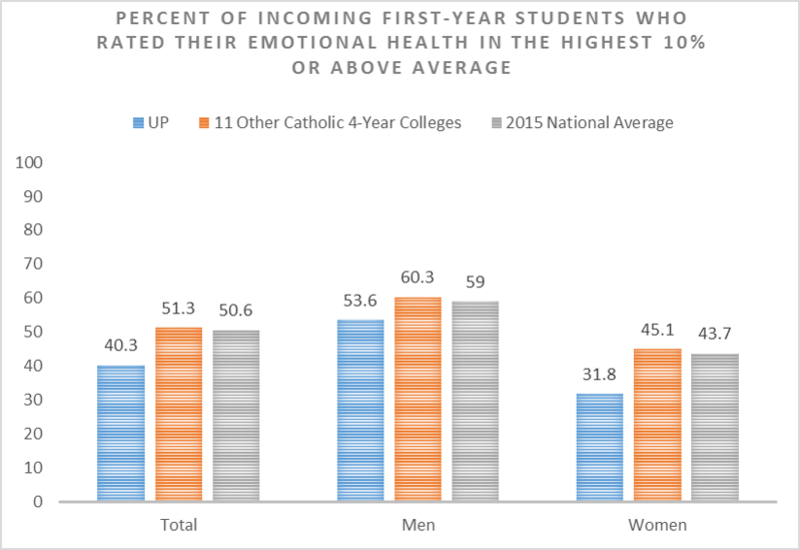 The percent who “frequently felt depressed” is 16.7%, compared with 9.9% at the comparison group of Catholic colleges and 9.5% of all incoming first year students nationally. 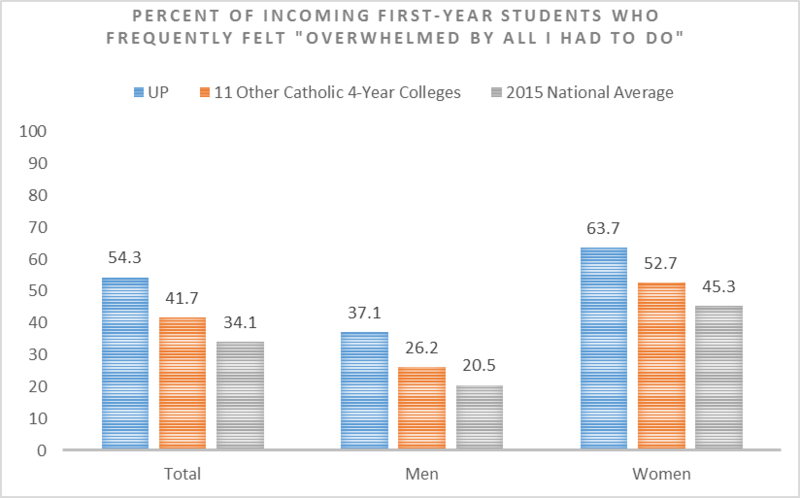 Likewise, the percent who “frequently felt anxious” entering UP is 48.4%, compared with 34% at the comparison group of Catholic colleges (no national data is available for that question). I’m surprised that incoming UP students seem to have slightly more psychological concerns than students at comparison schools. It’s possible that is a sampling issue — our response rate to the surveys is very high, so it is possible we are actually getting a more representative sample than other schools. But it is also possible that students are attracted to UP because it promotes a caring community, and thus may feel safer for students willing to acknowledge their mental health needs. But for faculty and academic staff who feel like more UP students are feeling stressed and stretched compared with other places we’ve been, it’s possible that is more than just a feeling. 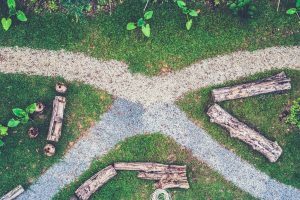 It’s probably a good thing that we have slightly more incoming students willing to consider counseling — though stigmas against psychological counseling continue to decline, they still exist and can be a barrier to getting help. Some of this data suggest our students might be open to the suggestion if faculty and academic staff suggest a visit to the Health and Counseling Center might be worthwhile. In all the different bits of data, women are more willing to report psychological concerns than men. This is a very common issue in mental health data, which raises important questions about whether women actually experience more mental health concerns, or are just more likely to express those concerns in ways that fit with self-report surveys. I tend to think the latter, which suggests that our male students with mental health concerns may be less open to easy conversations — though equally important to reach. The majority of our students, and all students nationally, do not report major psychological concerns. There is a fine line between wanting to make sure we help students who need help, and pathologizing a whole generation — contemporary college students, and contemporary UP students, have ups and downs like college students of any generation. More students these days are willing to attend college with psychological concerns in tow, and with a willingness to discuss those concerns. That can create valuable opportunities for faculty and academic staff to truly consider the whole person when we work with students. *The Catholic 4-Year Colleges (High Selectivity) group includes Benedictine College (Kansas), Christian Brothers University (Tennessee), Creighton University (Nebraska), Fairfield University (Connecticut), Providence College (Rhode Island), Sacred Heart University (Connecticut), Saint Mary’s College (Indiana), Saint Norbert College (Wisconsin), Seattle University (Washington), University of Detroit Mercy (Michigan), and us. If your students had a chance to tell you what they think about how faculty and academic staff matter to student mental health, what might they say? On February 15th many of us had a chance to find out. Karen Eifler and the Teaching and Learning Collaborative hosted a brownbag presentation by Molly Thomas and Rachel Mehlman in their roles as student leaders from the UP chapter of Active Minds – along with our colleague Sarina Saturn in her role as Active Minds faculty advisor. The discussion was robust, with student derived ideas leading to a productive back-and-forth with faculty, academic staff, and administrators. The UP chapter has been busy in recent years doing student campaigns to improve mental health awareness through chalking messages, symbol campaigns with paper flowers on the quad, contributing to events addressing coping with loss and stress, and more. The chapter also gets together students who are particularly interested in and concerned about supporting campus mental health – meaning that they think a lot about what is being done well at UP, what could use improvement, and what best practices we could borrow from other places. They think about, in other words, how what we do in the classroom matters beyond their grades. One relatively simple suggestion for teaching faculty during the brownbag was to make sure that on the first day of class we include some discussion of the mental health syllabus statement. Students know that much of the stuff on the syllabus is perfunctory, but they noted that it matters if professors take the time to emphasize the available supports and the reality that at least some students will experience mental health concerns each semester. Students also suggested trying to use the first week of class to humanize ourselves – to share some information about our own (sometimes messy) lives, to emphasize that we care about students as people, and to emphasize that we’re happy to talk with students during office hours. In the room we discussed how many new college students think of office hours as something like a high school teacher’s ‘planning period’ – meaning that many are reluctant to interrupt. Having some “meet and greet” office hours, even with ‘canned’ questions, can help students feel integrated. 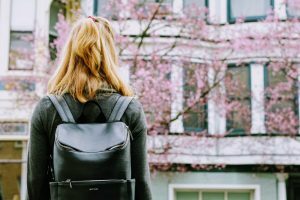 When students do start having attendance problems that may be mental health related, the discussion centered around first reaching out to students before making any assumptions. The group also discussed Early Alert as an important option, though students noted some concerns that submitting an Early Alert can quickly escalate. Some students have had experiences where an Early Alert submission led to dramatic intervention by Public Safety and contact with parents – which are often necessary to ensure students are safe, but which in some cases may be perceived by students as excessive and discouraging. It is important to err on the side of caution, but it is also important to be sensitive to student perceptions and some need for confidentiality. Another best practice mentioned in the discussion is to make sure we as faculty and academic staff know the available resources for students: remind students that appointments at the counseling center are free (or, more accurately, already paid for by virtue of regular tuition and fees) and confidential. Know that the Health and Counseling Center phone number now includes access to after hours phone counseling through ProtoCall. Know about the presence of diverse clubs that can help students with evolving identities feel at home: the Gay-Straight Partnership; Students Against Sexual Assault; other diversity and multicultural clubs; the International Club; etc.. Students also see diversity as closely related to mental health, and emphasized the importance of respecting different beliefs and backgrounds – whether that be in relation to religious strictures, cultural stigmas related to mental health, or the implications of racial, gender, and socio-economic inequality. Our hour-long discussion on the 15th back was too short – Active Minds had other slides and suggestions that we didn’t get to given the robustness of the discussion. Dr. Saturn, in her role as faculty advisor for Active Minds also encouraged anyone interested in more information to contact her via email (saturns@up.edu). But a good general take-away would be the reality that we can all benefit from more discussions and dialogue around mental health needs and concerns. Faculty and academic staff may be the experts in our subject areas, but students are the experts at perceiving how what happens in and around our classes impacts their well-being. Many of us know the feeling: seeing that first-year student “fail” (sometimes meaning a C, but still…) their first exam, and having to suddenly confront their first academic struggle. Or the senior getting rejected by their first choice graduate program, and having to suddenly reconcile what they thought they could do academically with what others think they can do. We recognize the feeling of inadequacy students feel. And the question about whether they belong. And the sudden uncertainty about their future plans. And the loneliness. 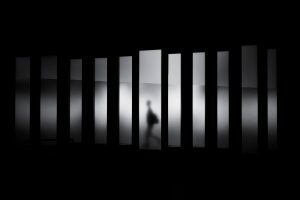 We often know the feeling because we still have it too: the scholarly paper rejected by the ideal journal after years of hard work; the student evaluations that sting with personal criticisms of a newly designed course; the memories or our own failures as students or our own graduate school rejections. I am generally wary of claims that the current generation of students is particularly vulnerable to mental health concerns – college students have always had mental health concerns, and if anything we have likely gotten slightly better at destigmatizing that reality. We need to do better at supporting students, not pathologizing them. But I am also intrigued by the idea that there is value in faculty and academic staff helping students learn to cope with failure, at least partially by acknowledging their own. Smith College uses a “Narratives Project” to have students and staff tell stories about failure – ideally helping others realize they are not alone. Are UP students as “failure deprived” as students at Stanford or Princeton? For better or worse, they are probably not. (Though Portland did kind-of make an appearance in the Times article, when it discussed the broader issue in higher education by noting “If it all feels a bit like a “Portlandia” sketch, that’s because it actually was one: in which Fred and Carrie decide to hire a bully to teach grit to students, one who uses padded gym mats to make sure the children don’t actually get hurt.”) It’s also important to not fetishize failure as part of a cultural self-help narrative. But these examples may offer a helpful reminder that our best students, like all our students, are not immune from mental health challenges. And sometimes hearing faculty and academic staff in the context of our classes or our advising talk about our own failures might help students keep things in perspective. Maybe, in other words, our own lack of failure deprivation could be put to good use. Anyone paying attention to higher education in recent years is well aware of two pressing issues on regular repeat: changing perceptions of student mental health needs, and the need to better attend to diversity and inclusion. But how might those two issues intersect? How might an equity lens inform the way academics, and academic institutions, think about student mental health? Several organizations working collaboratively on those issues (including the JED Foundation and the Steve Fund) recently produced an “Equity in Mental Health Framework” that highlights needs and offers ten specific “recommendations for colleges and universities to support the emotional well-being and mental health of students of color.” The full report is available on-line, and while it is a bit more oriented towards administrative policy than classroom practice it is worth a browse for the curious. For this teaching and learning blog, however, here are a few quick takeaways that might inform faculty and academic staff at UP. These types of statistics do not by themselves suggest that students of color are necessarily more or less likely to confront mental health issues – in fact, mental health concerns are a relatively equal opportunity reality (with some interesting and important demographic differences). But they do suggest that college and university environments may have a different social and emotional climate for students from diverse backgrounds. So what can be done to promote a social and emotional climate that is supportive and inclusive for all students? 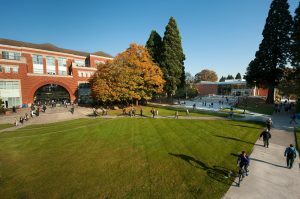 Many of the recommendations in the ‘Equity in Mental Health Framework’ are structural (including, for example, promoting “the mental health and well-being of students of color as a campus-wide priority” and to “actively recruit, train and retain a diverse and culturally competent faculty and professional staff”). There are also several that might be worth thinking about for our work with students in and around the classroom. Recommendation #4, for example, involves creating “opportunities to engage around national and international issues/events” including cultural movements such as Black Lives Matter and #MeToo. This seems like a natural fit for many educational contexts – both in and out of classrooms. It is not always easy to create constructive spaces that are genuinely educational to discuss current events that are complex and evolving, but it is worth remembering that doing so thoughtfully can matter to students who otherwise feel disconnected and marginalized. Recommendation #7, as a second example, involves offering “a range of supportive programs and services in varied formats” that might include discussion groups and workshops allowing students from diverse backgrounds to connect and engage with developing identity issues. This recommendation makes me think of the many positive experiences I know UP students have had with groups such as the Hawai’i Club, the Black Student Union, the Feminist Discussion Group, Active Minds, and many others that are student-driven but thrive with faculty and staff support. Working toward “equity in mental health” at colleges and universities is a big project that goes well beyond just what academics do with teaching and learning. But we faculty and academic staff can do our part by recognizing the ways teaching and learning can create further intersections for both equity and mental health. I always find the Spring semester much harder to start than the Fall. The days tend to be cold, rainy, and short. The bubbling enthusiasm of a new academic year has faded into a less inspiring feeling of being right in the middle of things. I realize, yet again, that I planned too much for the break and accomplished too little. And I have the sense that many students find the early part of the Spring semester equally challenging. So to start a new semester’s effort to integrate thinking about student mental health with thinking about effective teaching and learning, I thought it might be worth a quick primer (or, more hopefully, a reminder) about what is available through UP’s counseling services to students who seem to be struggling in our classes for reasons other than academic skills. WHO: The UP Health and Counseling Center offers both primary care and counseling services to students, with the counseling side of things comprising four full-time professional psychologists and two practicum students (usually third year doctoral students who spend 2.5 days a week on campus seeing students and organizing groups for one academic year). The director of UP’s Health and Counseling Center, Carol Dell’Oliver, is also a clinical psychologist who occasionally sees students amidst her busy administrative schedule. 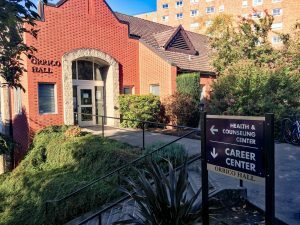 As of this 2017-2018 academic year, the Health and Counseling Center has also contracted with ProtoCall to make after-hours phone counseling available – students can reach licensed clinicians any time of day for ‘specialty telephonic behavioral health services’ by calling the main UP Health and Counseling phone number (503 943 7134) and taking option ‘3’ after hours. It is also worth remembering that UP’s Early Alert system has been expanded in recent years to offer a useful first point of contact and referral when faculty are concerned about student mental health. After initial consultations, UP’s counseling services focuses on short-term therapeutic work – ranging from a few 50 minute sessions to a few months’ worth of sessions. If students need more intensive longer-term therapy they are referred outside the University. As with college counseling services nationally, the most common issues students want to discuss in counseling are anxiety and depression – but it is also common to have students discuss relationships, adjustment to college, identity issues, and more. 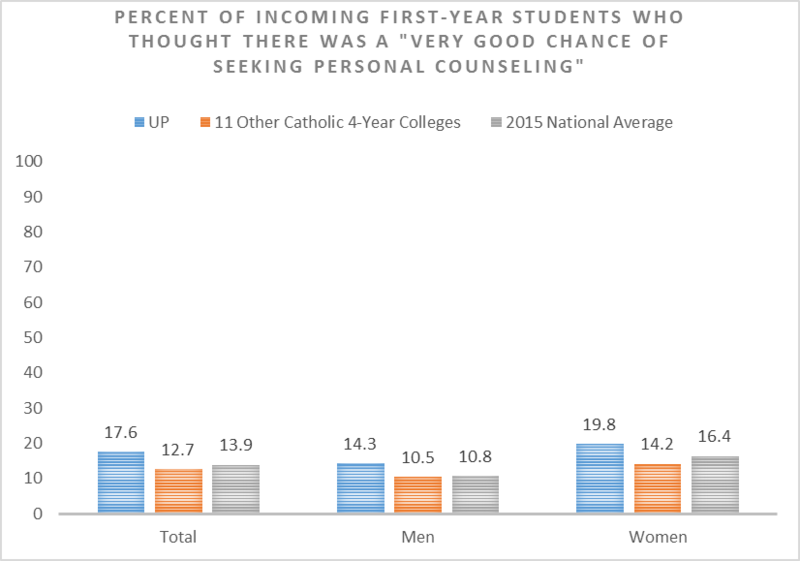 In prior years about 16% of UP students have utilized counseling services – which is slightly, but not dramatically, higher than the national average. The primary care side of the Health and Counseling Center can also help students with medication prescriptions when needs are mild to moderate, though when students have more serious medication needs those are often managed by outside providers. WHEN: The Health and Counseling Center is open Monday-Friday, 8:30 a.m. to 4:30 p.m. They close daily from 12:00 p.m.- 1:00 p.m.. As noted above, they also make after hours phone counseling available by calling the main line at 503 943 7134 and selecting option 3. WHY: There are lots of reasons for faculty to pay attention to student mental health – starting with the fact that any person in distress needs others to show they care. It is also both intuitively and empirically evident that students struggling with mental health concerns also often (though not always) struggle with their academic work. But it is also important for faculty and academic staff to remember that our job is not to become para-professional counselors in addition to professors – our job is to pay attention to, and care about, our students by helping them find the help they may sometimes need. So, as we approach the rainy early months of the Spring semester, I hope it is helpful to remember the ways UP makes such help available for students (including many parts of the University outside of the Health and Counseling Center).